The ESI Triage Research Team has a vision of widespread implementation, while retaining excellent reliability and validity. Explore these materials to further support ESI education, alongside the courses or just for daily reference. Call AHRQ at 800-358-9295 for a free copy or download the handbook here. 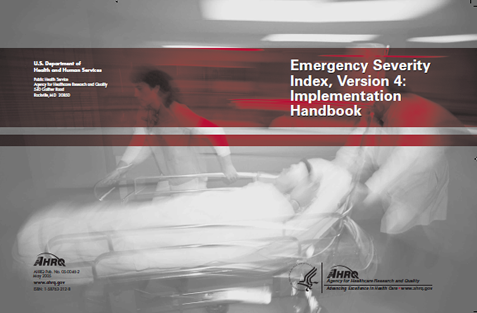 A set of three DVDs are available at no charge, upon request, entitled Emergency Severity Index, Version 4: Everything You Need To Know, and the companion, Emergency Severity Index, Version 4: Implementation Handbook, 2012 Edition. Several lectures describing the ESI algorithm and definitions in detail. Several acted out triage scenarios, followed by a brief discussion of the correct triage acuity rating using ESI v.4. A free hard copy of the wall poster comes with the handbook. Plus, for your convenience, make your own pocket card by printing the last page of the handbook. WANT MORE PRODUCTS? Check out our partner, Scrub Pocket for more ESI exclusives.